Still going strong on Whole30! I have really surprised myself on this. I cannot believe I’ve gone 2 whole weeks without any chocolate! All I really want is a tiny little Enjoy Life chocolate bar (we have four “fun size” bags in our chest freezer leftover from Halloween and I have to look at them every time I open the freezer door). IT’S SO HARD. But, I’m not giving in now! Week 2 was harder for me than week 1. Not because of the cravings, but because I spend so much time prepping food and trying to keep it interesting. It’s exhausting! It feels like all I do is clean the kitchen all day long. And my kids don’t eat a ton of what I make anyway so I usually end up making them different food. I know that’s not the best thing to do, but that’s a whole other blog post for a different day! I was even able to go out to eat this week for my mom’s birthday. My mom passed away from breast cancer in 2012 – I talk a lot about her in my post about her special cookbook – but we still celebrate her each year just like we did for years before she died. She loved the Crispy Honey Chicken dish from PF Chang’s so that’s why we go there! At least PF Chang’s has a special gluten-free menu to start. So I read the menu online beforehand, as any good Celiac diner does, and was a little nervous I wouldn’t be able to eat anything that was Whole30 complaint. I had a snack beforehand just in case. We did have a great waiter who was able to answer all of my questions and I ended up ordering a delicious salmon steak that was just grilled in olive oil and seasoned with salt and pepper with a side of sautéed spinach with garlic. My meal was simple but it was filing and I didn’t feel left out at all! Even without having a glass of wine! As you’ll probably notice in my food photos , I have a slight obsession going on with marinated onions which I posted about last week. I eat them on just about every meal. Please try them! You won’t be disappointed. They seriously are great on everything. 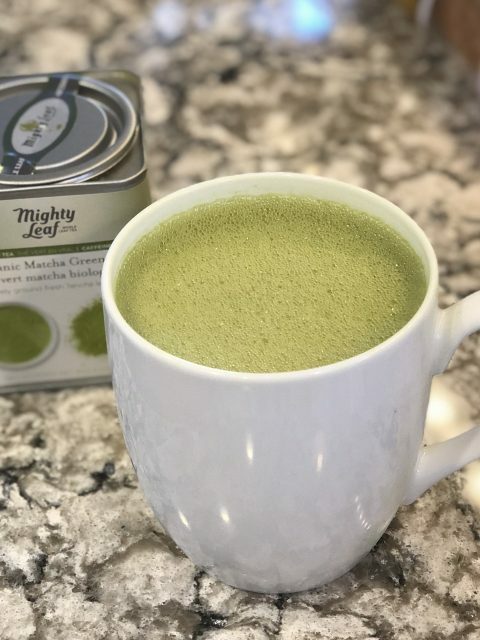 Here is a photo recap of my second week on Whole30! Note: Just assume that every morning I had coffee with collagen peptides and nutpods coffee creamer. I tried to switch it up this week and I’m really liking the hazelnut flavor! 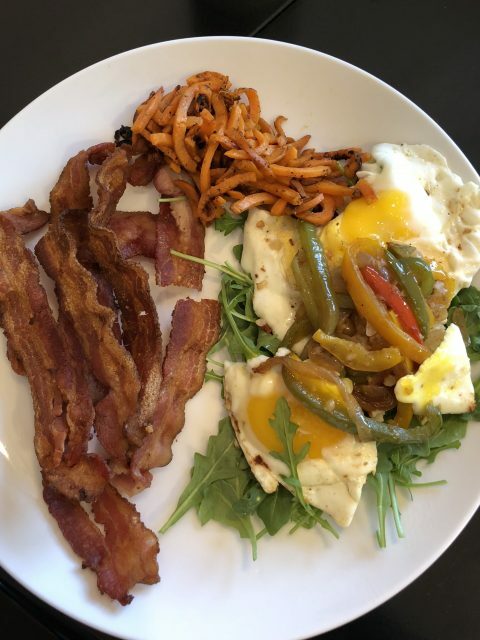 Breakfast – Bacon, sweet potato spirals, and fried eggs over arugula with peppers. 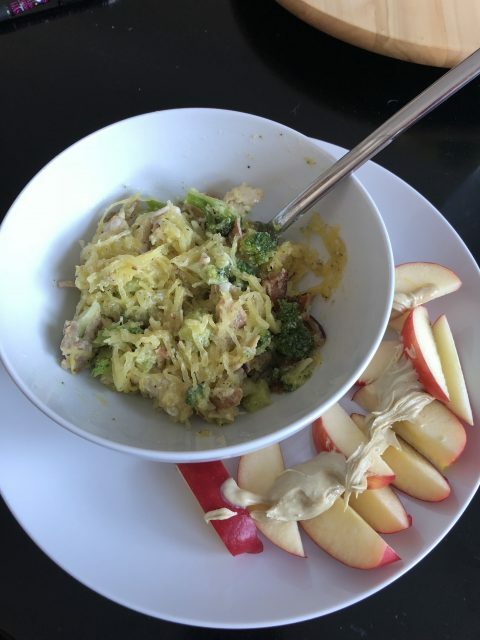 Lunch – Leftover creamy garlic bacon spaghetti squash alfredo, and an apple with cashew butter. 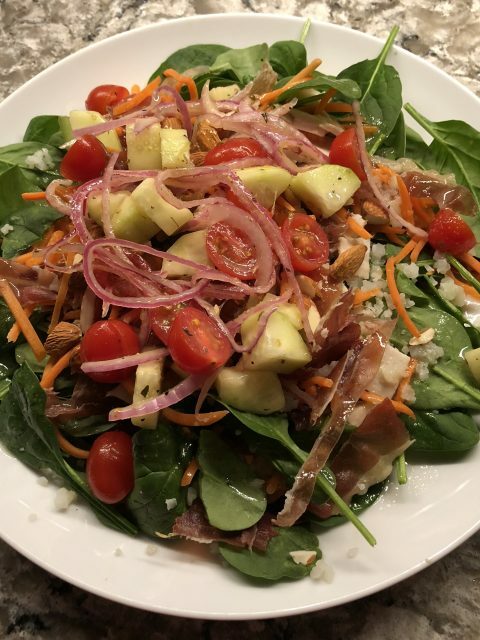 Dinner – Spinach salad with tomatoes, cucumbers, marinated onions, prosciutto, tomatoes, carrots, almonds, and Tessemae’s lemon garlic dressing. 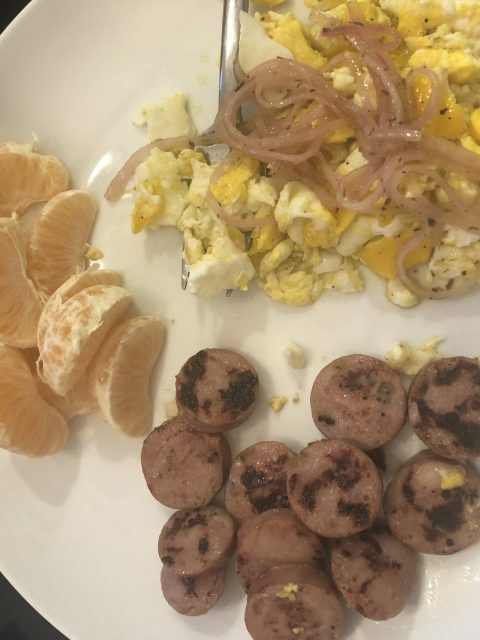 Breakfast – Scrambled eggs with marinated onions, a mandarin orange, and Aidell’s chicken apple sausage. 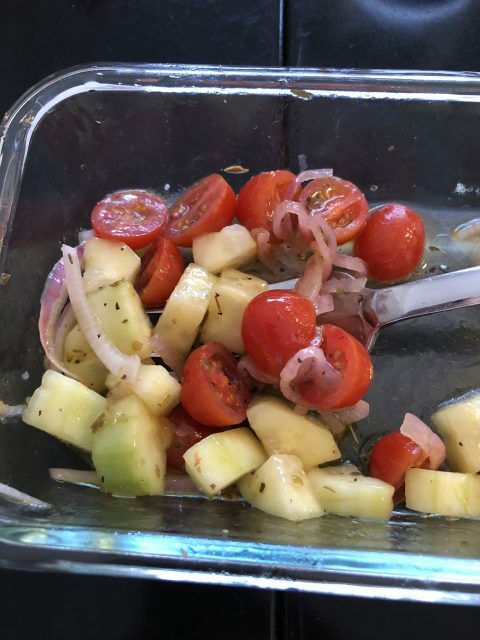 Lunch – I was really hungry in the car while out running errands so I had a Mixed Berry Rx bar and a Chomps stick and then I came home and had leftover greek salad. 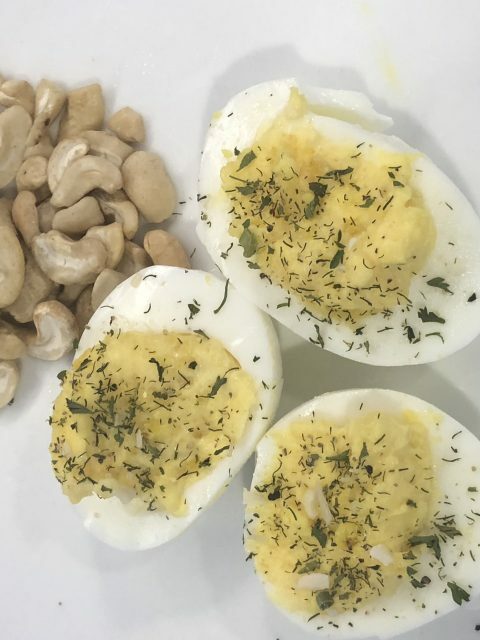 Snack – Matcha tea latte with almond milk, deviled eggs, and raw cashews. 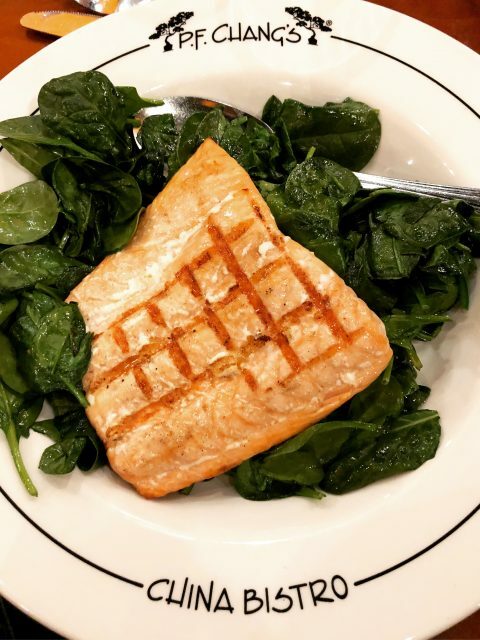 Dinner – Salmon steak over sautéed spinach at PF Changs. 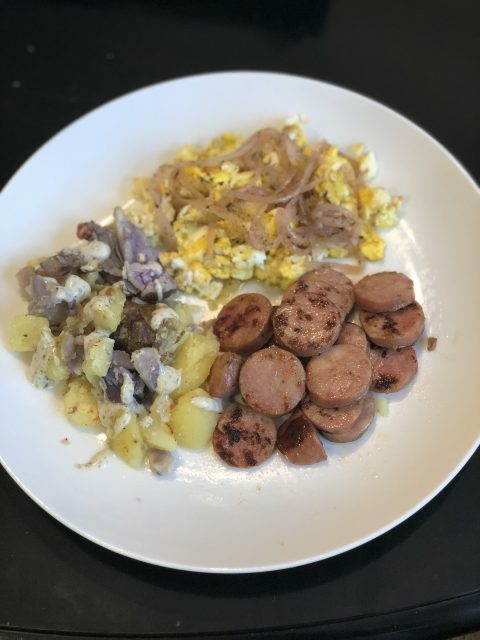 Breakfast – Scrambled eggs with marinated onions, potato smashers with Tessemae’s ranch dressing, and chicken apple sausage. 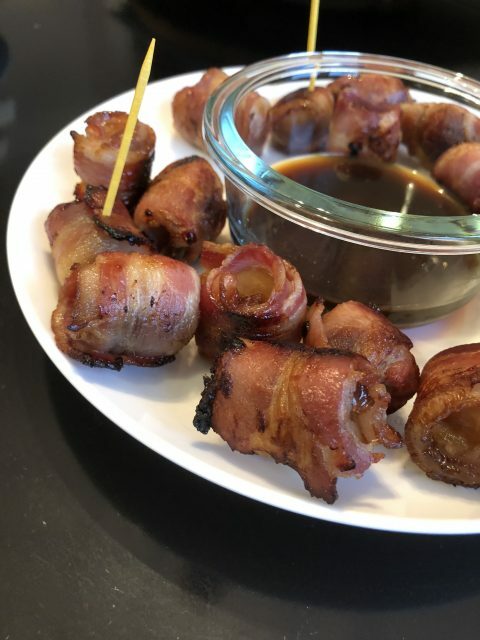 Lunch – It was the weekend so I had a late breakfast and I held off until I had some football snacks/dinner for the Vikings game (and an awesome win)!! 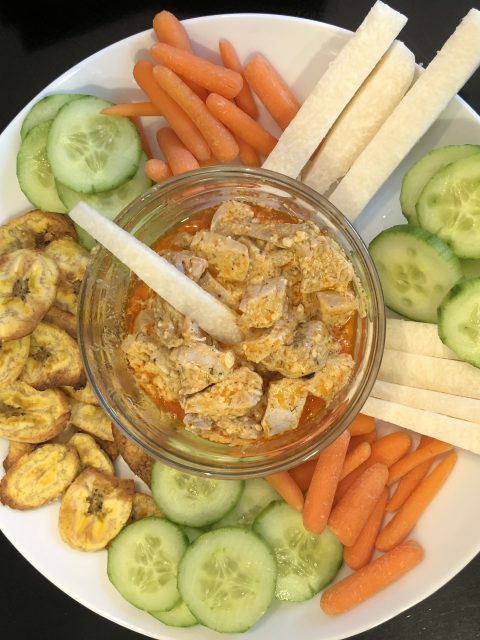 Dinner – Water chestnuts and figs wrapped in bacon and then dipped in soy sauce and I made a buffalo chicken dip along with some homemade plantain chips, cucumbers, carrots and jicama sticks. I think I overcooked the dip and it “broke” so it was pretty runny and oily, but it was still tasty! 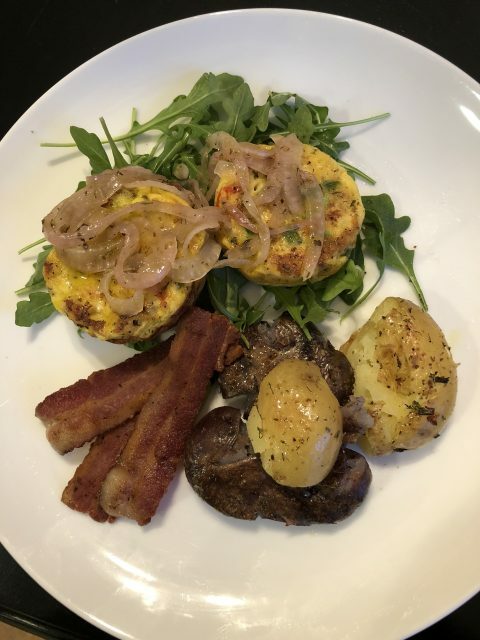 Breakfast – Two egg muffins with sausage, peppers, and onions over arugula with marinated onions, potato smashers, and bacon. 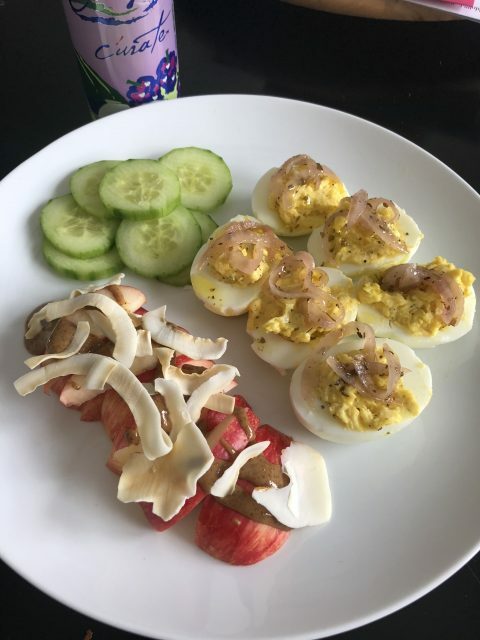 Lunch – Deviled eggs with marinated onions, apple with almond butter and coconut chips, and cucumbers. 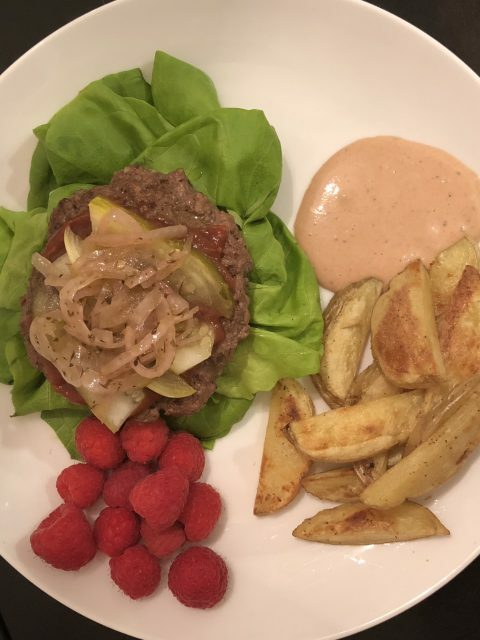 Dinner – Hamburger wrapped in butter lettuce, potato wedges with homemade mayo/BBQ sauce and a handful of raspberries. 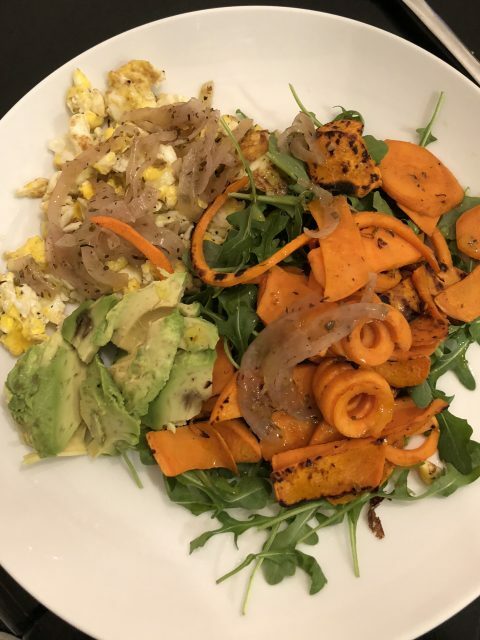 Breakfast – Scrambled eggs with marinated onions, sweet potatoes over arugula, and ½ avocado. 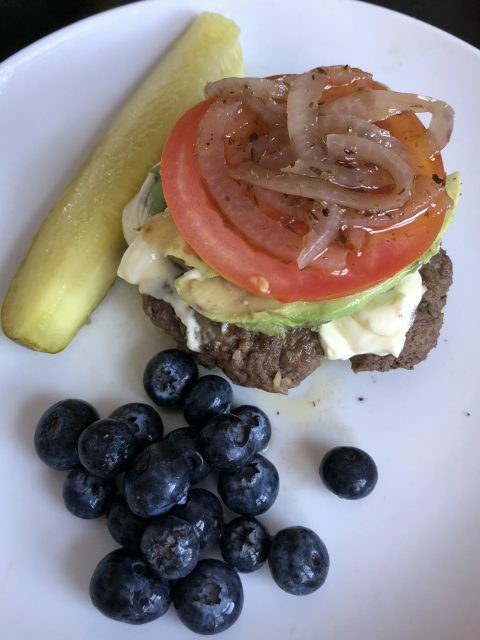 Lunch – Leftover hamburger with homemade mayo, avocado, tomato and marinated onions, a pickle spear, and blueberries. 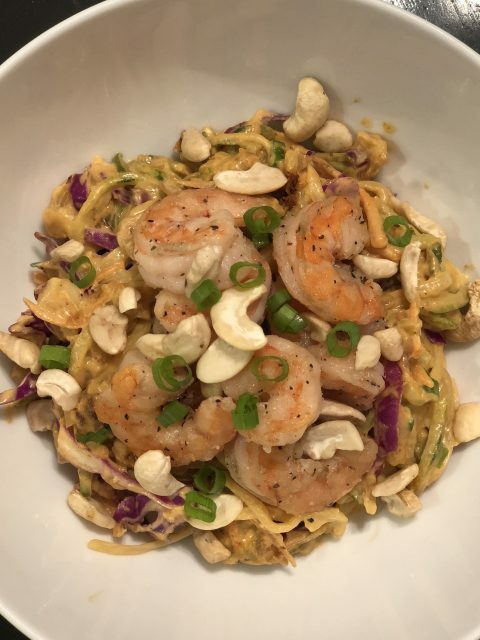 Dinner – Zoodle (zucchini noodle) pad thai with shrimp and a homemade cashew sauce (this did NOT turn out and I will NOT be sharing the recipe…yet at least. I’ll have to try it again). 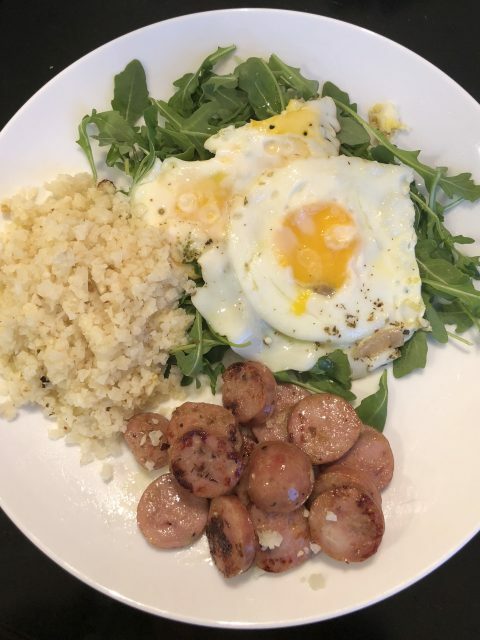 Breakfast – 2 eggs over baby arugula, cauliflower rice, and chicken apple sausage. 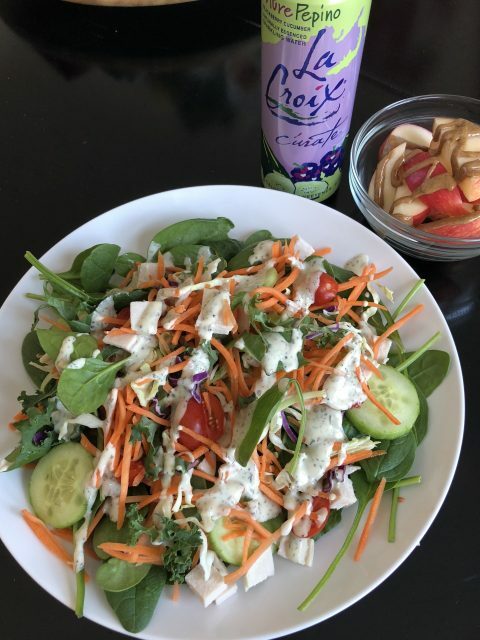 Lunch – Spinach/arugula salad with deli turkey, cucumbers, tomatoes, carrots, Tessemae’s ranch dressing, and an apple with almond butter. 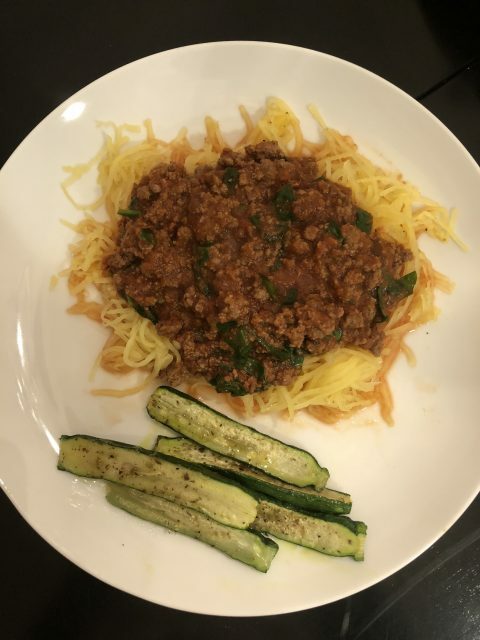 Dinner – Spaghetti squash with marinara with ground beef, and roasted zucchini spears. 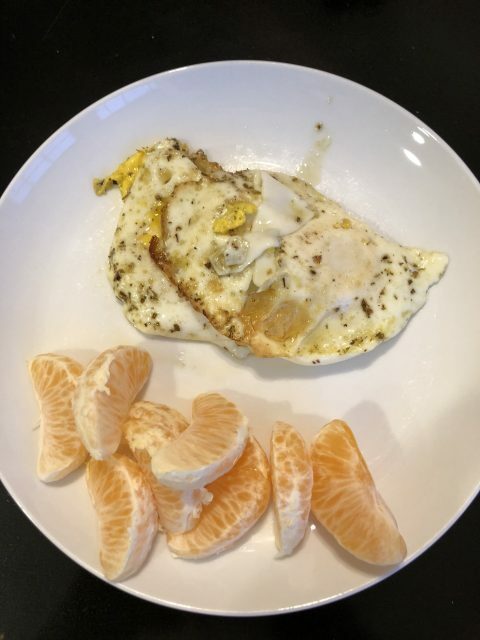 Breakfast – Two fried eggs with a mandarin orange (I was in a hurry this day and definitely didn’t have enough for breakfast). 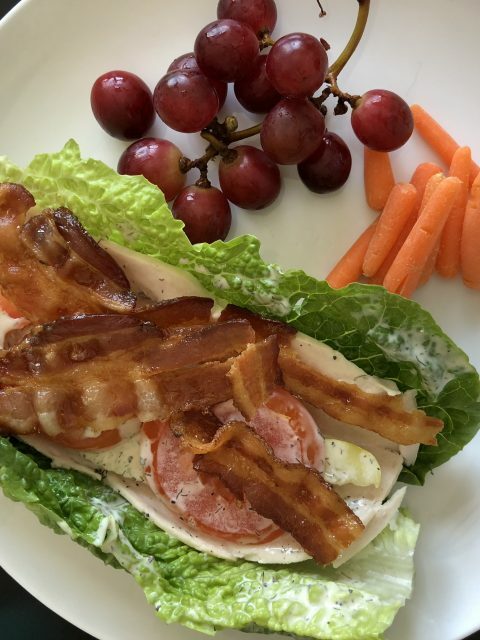 Lunch – Turkey BLT lettuce wrap with a pickle and Tessemae’s ranch dressing, baby carrots, and grapes. 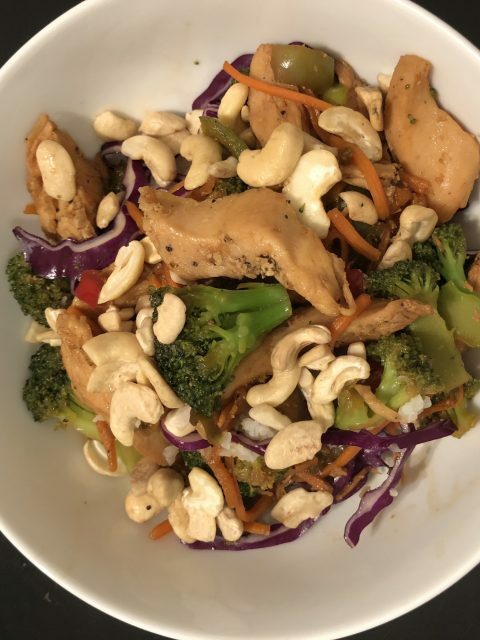 Dinner – Chicken teriyaki stir fry with broccoli, carrots, peppers, cashews, and purple cabbage over cauliflower rice. And now on to Week 3!! See you next week!